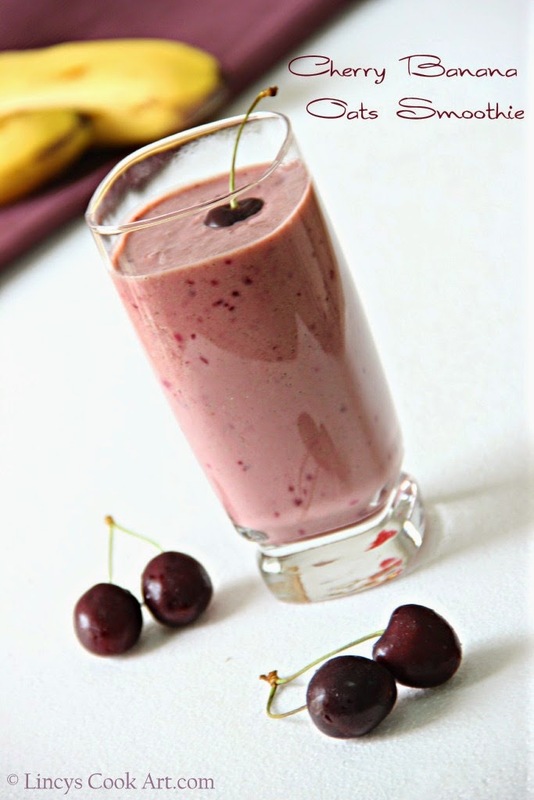 Cherry Banana Oats smoothie is a filling healthy breakfast drink. Can be prepared without much effort. So colourful and delicious drink. Banana adds sweetness to this drink. So you can prepare this drink without sugar also. Kids love this drink because it has a vibrant pink colour. I have prepared this smoothie using low fat yogurt. You can prepare with full fat if you want to. Healthy as well as easily digestible. Better way to start a day with light breakfast and keep active through out the day. Try this light and tasty breakfast drink and stay Healthy!!! Grind the oats in a blender as a fine powder. Keep the cherries inside the blender jar and blitz for a two to three times to grind coarsely to avoid big pieces. With this add the chopped banana pieces, powdered oats, chill yogurt and sugar; blend well till frothy and mixed well. Notes: Using sugar in this recipe is optional. You can use low fat/ full fat yogurt for this recipe. Refreshing smoothie for hot summer !!!! Love oats smoothie and this looks so delicious and healthy too.. Healthy and filling.. Looks yumm.. Eye pleasing smoothie..Soo delicious and fruity. great healthy breakfast! i love cherries.